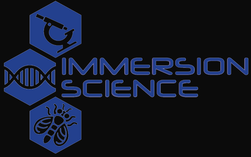 Don't take it from us..
Others think the Immersion Science Program is awesome too! I thought it was such a wonderful opportunity to get exposure to the research aspect of medicine and just to learn the various techniques and methods. it really amazed me how the mentors, especially Dr. O'Reilly, were there 100% of the way. its such a blessing to have someone so intelligent and influential guiding us the whole way and remaining a mentor even after the program ended. the connections we made and the insight we received was more than anything i could have imagined. The high school program at Fox Chase Cancer Center has been the single most influential experience in confirming my passion for science. It exposed me to what it is like to undertake real-life scientific research. I am so grateful for the wonderful instructors and other students I was fortunate enough to meet. I now feel confident in a laboratory setting and have learned so much about cancer research. The Fox Chase Cancer Center’s Immersion Science program has been an amazing opportunity. I have learned so much from my two instructors and have gained new passion for research. And, like a research facility, not only are students are able to work independently at their own pace but they are also encouraged to bounce ideas of one another. In the process of six weeks we have failed, we have solved, and we have learned– patience was a virtue. With this new knowledge, I have also had the unique chance to research with FCCC researchers over the summer as a CURE student scientist. The Fox Chase Cancer Center Teaching Lab program was a great part of my summer. I learned a lot about lab procedures and what it would be like to be a researcher. The teachers were knowledgeable, funny, and willing to help me whenever I was having trouble. This course was a very important deciding factor in helping me to realize what profession I wish to pursue, and I am glad to have been a part of it. When I came to the teaching lab I was surprised by how much I didn't know about working in labs. The teaching lab covers things that aren't normally found in high school science classes as well as hands on experience with real laboratory equipment and experiments. All of the mentors in the teaching lab were amazing with their attention to the students and always went out of their way to help us. 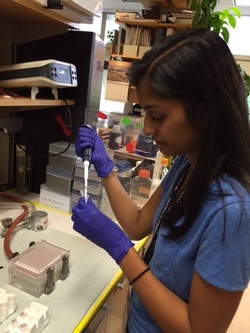 In addition to the technical skills I learned, the practice with team and group work with the other students prepared me well for my summer internship in a Cytogenetics laboratory. I really feel that the high school course definitely gave me a leg up on some of the other interns in the busy lab setting. The program exposed me to the world of laboratory research and taught me the skills I needed to work in an research environment. The program also gave my the opportunity to interact with researchers. Through this program I was given the a chance to continue a project that a started in the course over the summer in the O'Reilly Lab. I was mentored by a graduate researcher and learned laboratory techniques like western blotting and how to operate a confocal microscope. All the members of the lab took me under their wing. It was a very inclusive environment. I got to speak with researchers at multiple levels of their edu. I learned how the research community can be extremely cutthroat, but also very collaborative. Overall the program and the summer fellowship that followed has been one of the most valuable experiences of my life so far. The High School Program really opened my eyes to the progress that was made in cancer treatment and how vital these jobs are to the patients and families all over the world. Thank you so much this experience was truly life-changing. It was time well spent at Fox Chase. The experience I gained is priceless. The Fox Chase Cancer Center’s Immersion Science program has been an amazing opportunity. I have learned so much and have gained new passion for research. And, like a research facility, not only are students are able to work independently at their own pace but they are also encouraged to bounce ideas of one another. In the process of six weeks we have failed, we have solved, and we have learned– patience was a virtue. My time at Fox Chase Cancer Center has been amazing and enabled me to learn so much about how research is done. Fantastic program which solidified my desire to pursue science in college and the future. This was an amazing experience with amazing instructors. I have made so many friends, and will use all of the information to better my experiences in the future. I thought it was such a wonderful opportunity to get exposure to the research aspect of medicine and just to learn the various techniques and methods. It really amazed me how the mentors, especially Alana, were there 100% of the way. It’s such a blessing to have someone so intelligent and influential guiding us the whole way and remaining a mentor even after the program ended. The connections we made and the insight we received was more than anything I could have imagined. 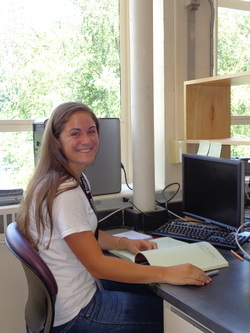 It was a pleasure to have 'J' as a member of the laboratory this summer. She is exceptionally pleasant and polite and was extremely interested in learning as many new techniques as she could. She not only wanted to learn the steps of the process or protocol, but wanted to understand the science behind the work. Her inquisitive nature was refreshing. She learned new things very rapidly, being able to perform new techniques after having been shown just one time. In addition to being able to work independently on her assigned tasks, she was always willing and able to help with various lab responsibilities and was an exemplary lab citizen. She was an absolute delight to have in the lab and we are all looking forward to her return. 'J' was smart and hardworking, and competent as a researcher thanks to the course. 'M' is very quick to learn, hard working, polite and will be a good addition to any lab. She is curious and asks insightful questions. This summer was a very rewarding exchange of ideas and knowledge, having an enthusiastic student. Our student performed some simple, but very important experiments, and out of those he contributed to an ongoing project in our lab, with a missing piece in the puzzle. Even more, he questioned the mechanisms behind his results, and proposed a hypothesis which eventually could be tested, and could serve as the basis for a future intriguing research project. I was impressed with my student's ability to analyze her own data and to think critically about what her results meant. Science frequently involves troubleshooting when experiments fail for one reason or another, and she was able to do this exceptionally well. Her presentation skills are equally excellent and she was able and to explain her results to the rest of the group at both formal meetings and during informal discussions. Whatever you are doing to these kids, it is working! My student knows how to do everything he needs just walking in the door. If you keep this up, I will take a high school student every summer.